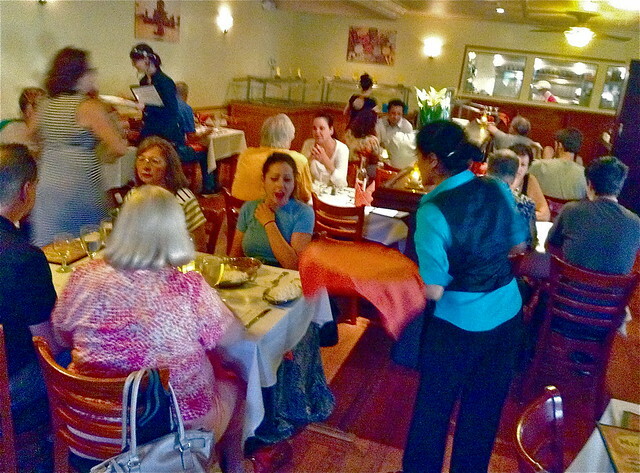 Anita Chhantyal didn't know why the Nirvana Indian restaurant she and her husband had just relocated to Lafayette HIll from Conshohocken was filling up this opening night. But she suspected that others like your correspondent and his wife, had simply seen the "Nirvana" and "Open" signs draped over the old sign, "The Lucky Dog." The dog's luck must have run out. Natives of Nepal, Chhantyal and her chef husband, are donating 20% of proceeds the first few days to the Nepalese earthquake relief effort. More than 10000 people died in the disaster, Chhantyal reports, and a niece of hers is recovering from leg injuries. When they were not pausing for impromptu interviews,two young American waitresses with enthusiasm for Indian food, bustled around filling orders from eager first night patrons.